I manage to try the $2 Laksa~ Mission Accomplish!! Easy to drink & it was a flavourful bowl~ sweet yet mild spicy!! I was slurpring up till the very last sip!! 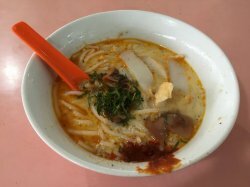 $2 Laksa is not enough for me! !